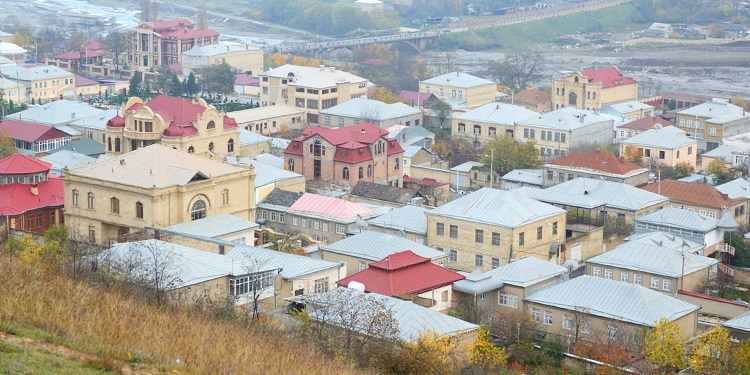 Red Town or Krasnaya Sloboda is the largest Mountain Jewish settlement in Azerbaijan. It is the only entirely Jewish settlement outside of Israel and the United States. There are several working Synagogues here. Moreover, visitors can see Star of David everywhere in the settlement. Jewish cemetery is laying on the top of the hill, looks the marvelous panorama of Caucasus. Jews settled in Azerbaijan for thousands of years and built several communities and towns. There are three main group of Jews in Azerbaijan. The biggest and the most ancient community is Mountain Jews. There is also Ashkenazi Jews community- who came to Azerbaijan during 19th and 20th centuries and Georgian Jews community who migrated to Azerbaijan in early 20th century. The people of Red Town is Mountain Jews Community. The settlement has been inhabited by Jews since the 13th century. Mountain Jews practice their own kind of Judaism. It combines Old Testament and other practices along with mysticism. They also speak a distinct language to Hebrew and call it Judeo- Tat or Juhuri. It is closely related to Persian language. Mountain Jews settled in North Azerbaijan starting from an early Medieval period time. Their presence in the region strongly affected the neighboring people. Moreover, some historians claim that Khazar people- an ancient Turkish tribe partially accepted Judaism after the close interactions with the Jews population of Caucasus. The number of Jewish community gradually increased in Azerbaijan starting from the 18th century after the destruction of Jewish settlements in Persia by Nader Shah. Upon receiving the confirmation from the local ruler, they moved to Quba, to the place of Red Town. There was a Jewish settlement before that movement, but with the arrival of new population, the small settlement changed to be a new city and named Krasnaya Sloboda or Red town thanks to the red roofs of the houses. The convenient location of the town on the trading road between several cities, support of the Quba Khanate and fertile lands helped the Jews to grow their city. Gradually, the town became one of the biggest Jews communities in Azerbaijan. Later, in 1851, the bridge built on Kudyalchay greatly affected the trade relations with other communities. Eventually, the products of Red Town started to be exported to other places. Especially, the quality of the apple grown here became very famous. Apart from the farming, the local people also used to develop special carpet waving and other types of craftsmanship. Through the three hundred years since the establishment of the town, people of Red Town has managed to preserve their own culture, customs and languages. The city has became a state monument. Furthermore, there is now an extensive support to the town by Azerbaijan government that helps the community stay alive. The unique culture and heritage of this small settlement attracts tourists from all around the world. Currently, there are about 3000 residents of this little town.